Small note before reading: I wrote this for fun, don’t take it too seriously. “Speechless” “What is going on with this team! ?” Seem to be the top comments in this area. It is hard to fathom this start, even without James Wisniewski. Surely all of our players would be scoring, and our defense would be good at…well..defense! It is quite a shock to see such a slow start, but when you look at the past three season, it shouldn’t be, in October over the past three years we went 7-3-1, 4-6-0, and 6-5-1. 2. 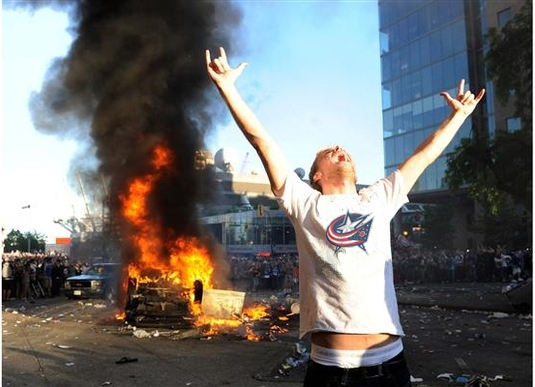 Lets Riot: Yes, ala Vancouver after The Stanley Cup Finals last year, blow stuff up, break things, just all out anarchy in the streets of Ohio. Well with the weakened economy rioting is a bad idea, not to mention you could get arrested (unless you don’t care about that, go for it.) And in the current times, I’d worry more about the loose bears,lions, wolves, and monkeys roaming around doing all the damage for you. With Boston’s 4-1 loss to Carolina last night, the four conference finalists from last season (Boston, San Jose, Tampa Bay and Vancouver) are a combined 6-13-3 in this young season. All four are in the bottom third in the leagues in standings, although it is still early and there is plenty of time to turn it around. Let’s take a look at what ails each team. The Boston Bruins have only allowed 2.17 goals per game (10th) but can’t score. They are dead last in goals per game (1.67). They’ve only scored more than two goals in a game once, a 4-1 win over Tampa on October 8th. Obviously, with the team’s offense struggling, one would assume that their powerplay would suffer. That would be correct, as the Bruins are near the bottom at 8.3%. Rich Peverley is the team’s leading goal scorer (3) and only he and Marchand have multiple goals. This is a far cry from last season when they finished fifth in the league in goals for. Roberto Luongo allows a goal in a loss to the Flyers. Vancouver has scored more than Boston (2.33) but it’s not enough to get the job done, not with the lineup they have. But their biggest problem is that they can’t stop anyone. They’re tied for fifth worst in goals allowed per game (3.17). Their penalty killing is near the bottom of the league at 79.3%, and they’ve been shorthanded 29 times so far, which is near the league high. Looking deeper into the numbers show that starting goalie Roberto Luongo has continued his struggles from June. After four games, he has a 3.70 GAA and a .856 save percentage. Backup Cory Schneider (2.03, .953) has been considerably better, but he won’t wrestle the starting job from Luongo any time soon. 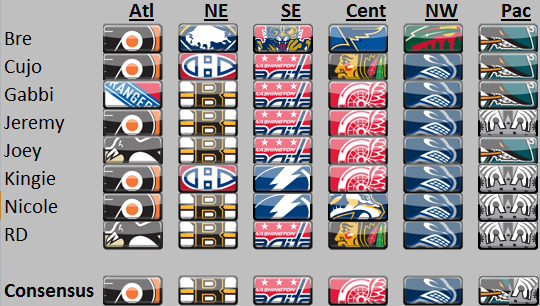 Here are our picks for the division winners, conference finalists, Stanley Cup finalists and winner. Most divisions had a healthy majority, except in the Pacific, where we were split between San Jose & Los Angeles. Vancouver was an almost unanimous selection in the Northwest. The competitive Central had four teams represented. Throughout the playoffs we’ve done a playoff pool, round by round. The point system was 1 point for a correct team pick and 1 bonus point for a team in the correct amount of games. 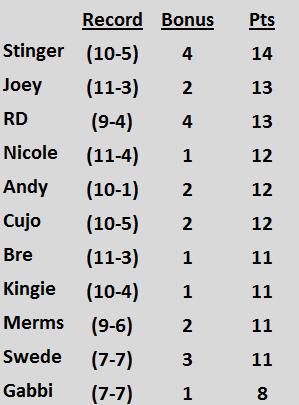 Here are the final standings. Congratulations to Stinger, our 2011 champion! Vancouver took a huge step towards its’ first Stanley Cup victory on Friday, beating Boston 1-0 on the strength of a Maxim Lapierre goal. 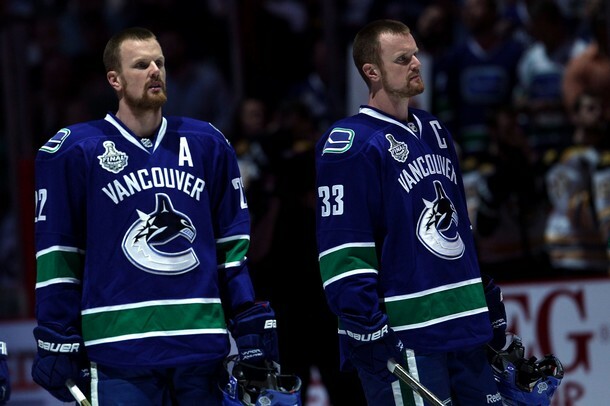 However, for the fourth time in the series, the Sedin twins were held off the scoresheet. Daniel totaled 41 goals and 104 points in the regular season, and carried that over to the playoffs where he’s tallied 9 goals and 18 points. In the regular season, Henrik posted 19 goals and 94 points, and coming into the Stanley Cup Final, led in playoff points with 21 points. In the Stanley Cup Final, the two have combined for two points (1 goal, 1 assist) through the first five games, and both were in game 2 by Daniel. Daniel’s taken 20 shots in the series, but Henrik has only four, and didn’t register a shot until game 4. In the Western Conference Finals against the Sharks, the duo combined for a mind boggling 18 points (3 goals, 15 assists) in the five game series. 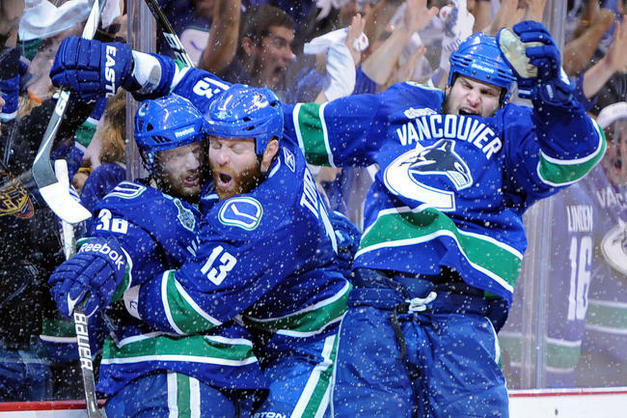 In game 4 alone, they racked up 7 points in the Canucks 4-3 win. They tallied 12 points in the first round series against the Blackhawks. Their second round opponent, Nashville, “slowed” them down for 7 points in 6 games. The twins haven’t had to carry the load in the Final, which is a good thing for Vancouver. Guys like Raffi Torres, Alex Burrows, Jannik Hansen and Maxim Lapierre (regular season total of 55 goals between the four players) have all scored in the series and the team is leading in the series. But it’s also a bad thing, as the Canucks’ top scorers are not producing. The biggest problem seems to be on the power play, where the Canucks have gone 1 for 26 in the series, after leading the league with a 24.3% power play. If the Sedins can get on the scoreboard in tomorrow night’s game 6, it will increase Vancouver’s chances of winning their first Stanley Cup in franchise history. After last night’s game four, I’m convinced that anyone outside of Boston and Vancouver can’t stand both teams. In game three, Aaron Rome knocked out Nathan Horton. Rome was ejected and suspended and you thought it would just end there. That was far from the truth. With the Bruins leading, the game degenerated into scrumfest. Daniel Sedin, Andrew Ference (twice), Shawn Thornton, Alex Burrows, Ryan Kesler, Milan Lucic, Kevin Bieska and Dennis Seidenberg were all given ten minute major misconducts in the third period. Kesler and Seidenberg even dropped the gloves. Throughout the series the two teams have traded alleged bites, taunts, slashes, elbows, sucker punches, anything you can think of. Point is both teams have made this a dirty, dirty series. Some have defended it, calling it “Old Time Hockey.” No, no, incorrect. Old timers would be embarrassed that this is the Stanley Cup Final. Think Bobby Orr would approve of finger taunting? No way. Last night the bad blood kept going late in the third period. It all started (restarted?) when Brad Marchand and Christian Ehrhoff were racing for a puck in the Canucks’ zone. Marchand tried to go around Ehrhoff and with his free hand, semi-clotheslined the defenseman. Daniel Sedin skated in and Marchand ducked under him and dumped him. The only positive thing Keith Ballard did all night was grab Marchand. (Sidenote: Wow, was Ballard brutal last night.) That put the Nucks on the powerplay. Of course, it didn’t last long, as Alex Burrows slashed Tim Thomas’ stick out of his hands, resulting in a Thomas chop across Burrows’ calves. Burrows had enough and round two began. Kesler and Zdeno Chara picked up misconducts, and their nights were done. Rooting for a team in this series is almost like picking the lesser of two evils. One can root for a team because they hate one team more, but feel dirty for doing so. Last year’s Cup Finalists, the Blackhawks and Flyers, are pretty well unliked throughout the league, and they didn’t even garner this much negative attention. My plea for both teams for the remaining games is play for the Stanley Cup. The trophy that’s awarded to the best team in hockey. Not the team who can dive or scrum best. Play hockey, guys.